Mr. Cassidy underestimated the sheer power of the Back Nine Rush’s draw. In spite of the driving rain and the knowledge that Carson Wheelright, dubbed “Kid Carson” by his peers, would almost certainly be the champion of the competition, the field before him sat as stacked with participants as at any other time. Peering past the water dripping off his visor, Mr. Cassidy’s glinted eyes took in the vast array of pre-adolescent boys on their bikes, all ready to plunge into the wild rough of Hole 10. Years ago, he would have cringed at such an unruly gathering of boys on the edge of the Burnt Creek Golf Course property. In fact, back then he found himself using up most of his time, not managing the course like his job demanded, but instead chasing trespassing kids off the property. Knowing that most juvenile trespassers hoped to gather up stray golf balls for reselling to golfers, an exasperated Mr. Cassidy struck a deal with the neighboring kids. He told them he would offer two positions on the golf course as official golf ball gatherers, or creekboys, as they would informally come to be known. Only creekboys would be allowed on the course, and all others would stay off the premises of Burnt Creek Golf Course unless as paying customers or until an opening came for another creekboy position. The creekboy positions, he determined, would be decided by the Back Nine Rush, a competition in which any aspiring creekboy would have one hour at Hole 10 to gather as many stray golf balls as possible. The competitor with the greatest amount won the position. Mr. Cassidy hoped this might at least slow down the property infringement problems and give him some more time to perform his regular duties, but he never imagined that it would go far beyond that. In spite of low expectations, he found that his trespassing problems--with the very rare exception--disappeared. More than that, however, he witnessed, amazed, as an entire kid culture formed. The creekboy position became a marker of respect among local kids, and the surrounding neighborhoods boasted young boys that grew up hoping to become one of the elite to hold the coveted position. Though he felt a detached fondness for this world that came about due to his desperate choice years ago, Mr. Cassidy knew better than to take credit for it. In reality, he recognized his place as an informed observer to what evolved since then. That was how he felt as he supervised the soaked crowd before him, noting the excitement, anxiety, and anticipation in the boys’ faces. He nearly smiled. Mr. Cassidy recognized that, while he was no longer the younger golf course manager that he used to be, these boys managed to make him at least feel young. 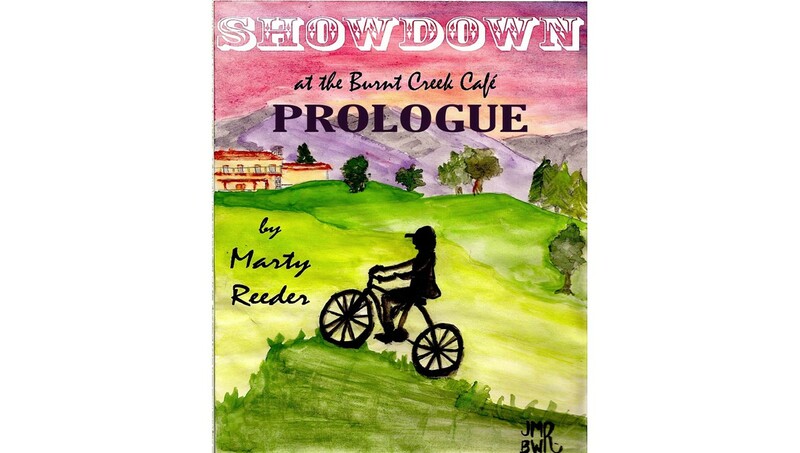 A couple youth shifted eagerly, and Mr. Cassidy saw no one else guiding their bike through the empty, sage-brush covered prairie leading up to the Burnt Creek course. Time to begin. Mr. Cassidy opened by explaining to the group before him that with the leaving of one of the course’s creekboys, an opening had been made for another, which is why they were having a competition on this day. Mechanically, Mr. Cassidy spoke out the rules of the Rush, which each boy knew by heart, but which he felt obligated to share anyway. Somehow he knew that skipping it would rob the boys of their ceremony--and ceremony was about all they would get this year. Among the front ranks of bicycles and baseball caps sat Kid Carson, the 13-year-old creekboy prodigy. Eight months before, the slick golf ball gatherer handedly won the competition at the unprecedented age of twelve--thus earning his “Kid Carson” nickname--but the weekend preceeding taking up his creekboy duties, he broke his leg. Unable to perform his duties for that fall, he had to forfeit to the competition’s second place winner, Adam Grizzwald. The fact that Kid Carson was back again, with a leg that had all winter to heal and strengthen, not to mention turning one year older, placed him as the clear champion in everyone’s minds. Mr. Cassidy sensed that the general participant attitude this time around was one of simply being a part of the ceremony while Kid Carson secured his inevitable title. Reaching the end of the short list of rules, Mr. Cassidy was about to pull out his watch and officially begin the Back Nine Rush, but he found himself interrupted. 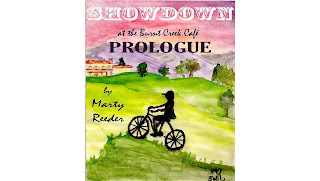 Mr. Cassidy saw the bulky 13-year-old James Woodson glancing over his shoulder, his hand on the back of his bike seat. Following the look, Mr. Cassidy noticed a small boy on an older, grey bike that seemed a bit too big for him. The boy looked uncomfortable under James Woodson’s glare, but he said nothing. “What’s your name, young man?” Mr. Cassidy spoke loudly to get his voice past the pattering of rain on the green grass around him. “I’ll be ten at the end of the summer,” Bert said. Though his tone sounded respectful, Mr. Cassidy sensed something near defiance in it as well. While Mr. Cassidy noted that Bert’s physical size did not belong among this group of boys, ranging from as low as twelve to as high as fifteen-years-old, the fire in Bert’s eyes proved he belonged there perhaps more than any of them. Something in Mr. Cassidy held him back, however. Seeing the clump of boys gathered around James Woodson made him nervous. Mr. Cassidy did not want to haphazardly throw out new regulations and rules, as that seemed to mar the simple purity of the competition, but the last thing he wanted was for harm to come to a little nine-year-old. Next thing he knew someone would investigate this whole, inconspicuous program of his. Maybe an age limit would be appropriate. Yet Mr. Cassidy felt strange tampering with the kid culture without first consulting with a kid--he felt there might be repercussions beyond what he could predict. He glanced towards Adam Grizzwald, the 15-year-old creekboy who, with Teddy Romney’s exit, had just been promoted to creekboy of Burnt Creek’s Front Nine. Adam seemed aloof to the situation, however, gazing up towards his territory, as if eager for the competition to be over so he could explore his new jurisdiction. Mr. Cassidy took a breath, about to delve out his judgment, but he stopped as he noticed Kid Carson angle his head. There was something about Kid Carson that carried special weight, even for Mr. Cassidy, who generally tried not to get caught up in the hype of his own program. Kid Carson did not express anything verbally, but he made sure Mr. Cassidy was watching, then he glibly shrugged his shoulders, as if to say, why not? If anyone could prove that age did not need to be a factor, it was Kid Carson. Mr. Cassidy suppressed another smile, giving the anticipated champion a gentle nod, and then voiced, “The Back Nine Rush has no age limit.” He eyed a sulky James Woodson and then added, “Now, let’s get started.” Raising his hand in the air, Mr. Cassidy shouted the go ahead while checking his watch so he could determine when an hour’s time passed. Water sprayed everywhere as bikes pedaled off to the thick, brush-filled portion of Hole 10, each eager to get a jump start on the others. Bert Gardner, however, held back. The wiry nine-year-old waited until Mr. Cassidy noticed him, then nodded gratefully before hefting awkwardly onto his bike’s large frame and zooming down into the rough wilderness of Burnt Creek’s Back Nine. With just a few minutes before the hour ran out, Mr. Cassidy waited patiently. While many boys had returned with their haul, most preferred to eek out every last second possible. In fact, he watched as James Woodson and some boys congregated at the edge of a grove of trees about fifty yards away. Squinting in the rainfall, which had now lessened, Mr. Cassidy thought he recognized James’s older brother Jesse in the group. They huddled in deep discussion about something, then Jesse hopped off his bike, foraged around, and returned to the group, dragging something with him. Mr. Cassidy could not see exactly what occurred, but then he witnessed the group of boys peel off one at a time, returning to where Mr. Cassidy stood on the shiny wet, back patio of the Burnt Creek Café. One boy remained. Mr. Cassidy recognized the hunched form of Jesse Woodson waiting next to a screen of cottonwood saplings. But waiting for what? Within a few seconds, it became clear. Jesse positioned himself next to the trail leading back to the clubhouse out of the rough. Only seconds later the streaking form of Bert Gardner burst out of the main grove of trees in his attempt to make it to the finishing point before hour’s end. As Bert’s skinny legs reached downward to pump the bike forward, Mr. Cassidy could not help but wonder at his ability to manage a machine clearly meant for someone a couple years older. The boy was nimble. Nimble as he was, however, he could not have expected the ambush. Just as Bert Gardner sped past an unassuming Jesse Woodson behind the screen of small trees, the ill-intentioned kid edged his bike forward. This movement caused something on the ground to suddenly pop up--a carefully positioned tree branch. The timing perfectly coincided with Bert Gardner’s passing and--with a gasp--Mr. Cassidy watched as the branch entangled itself in a shower of splinters with the spokes of Bert’s bike. The results were immediate. The bike instantly stopped, with the back end coming crashing forward, launching the little body of Bert forward. The panic on the boy’s face came to a halt only when he smashed into a mound of stones near the bank of the Burnt Creek. Through the trickling rain, Mr. Cassidy heard the sickening crash of body and bike travel across the open space between them while his stomach plummeted. His worst fears had been realized. Jesse Woodson put on his best show of surprise at the occurrence before biking over to the fallen Bert. He then offered his hand to the injured rider. Mr. Cassidy watched, relieved to notice the boy at least move, even if it was to face the Woodson boy. There was a pause as Jesse’s hand remained in mid-air, his sneer impossible to miss. Mr. Cassidy, by this time, determined that enough was enough. As the only adult in the vicinity, he knew he needed to intervene, get the boy some medical attention, and discipline the snaky Jesse Woodson--probably even press charges. Before taking a single step towards the incident, a bike worked its way in front of him. Mr. Cassidy looked down and saw Kid Carson. Though the 13-year-old did not say a word, his face told all: let it be. Mr. Cassidy verged on objecting, but then Kid Carson’s gaze trained his down to the area of the incident. The sneer in Jesse’s face disappeared as his hand remained untouched by the downed Bert Gardner. He scowled, then leaned down and whispered what Mr. Cassidy could only imagine were despicable threats. Then he took to his bike and began working his way towards the patio. Seeing the grim faces of the on-looking Mr. Cassidy and Kid Carson, however, made him realize that they had witnessed the whole thing. Trapped, he faltered in his pedaling before deciding to vacate the premises. Jesse Woodson exiled himself towards the badlands between the golf course and the closest residential neighborhoods. Then Mr. Cassidy watched as Bert Gardner slowly picked himself up off the ground. It was clear by his movements that he had been banged up pretty good by the accident. The boy limped over to his bicycle, whose front wheel rim and spokes snarled in a disfigured, pokey mess. Bert tried to look it over, but some blood trickling from his forehead kept him from getting a clear view. He used his shirt sleeve to streak the blood away from his eyes. The moment he registered the damage to the tire, he seemed to want to drop both bike and himself to the ground again. Mr. Cassidy paused, expecting the kid to cry and give up. The beleaguered golf course manager began to plan what he would say when he went to comfort the boy and help him with his bike. Before he could work around Kid Carson in front of him, however, the same resolve he had seen in the 9-year-old’s eyes before the competition seemed to light up within him again. Hefting the mangled bike upwards, Bert Gardner brought the whole frame of the oversized machine onto his back so the front wheel stuck out before him with the back wheel resting on the ground. Then, in a painstaking limp, Bert struggled along the trail, his face grimacing and his legs trembling. A couple of times, he slipped on the wet trail, but with lengthening pauses he still managed to push himself back to his feet again. Soon he reached the final, daunting incline to the clubhouse. By this time, Bert Gardner was beyond despair. He stared at the intimidating steepness before him, gathered all the remaining force his wiry frame could manage, and worked his way to the top. Once there, kind participants approached to help with his bike, but Kid Carson deftly fended them off. 9-year-old Bert Gardner made it there on his own and would take care of his bike on his own, not out of pride but out of principle. Mr. Cassidy hesitated once more, still feeling as if he should do something, but finally he sighed and shrugged his shoulders. He recognized, as much as ever, that this whole creekboy culture went beyond his understanding. For the next quarter of an hour each participant turned in their stash of golf balls, and Mr. Cassidy ceremoniously counted them in front of the group. Next to last, and unsurprising, was Kid Carson, who brought in an impressive twenty-seven--more than ten better than the nearest competitor. Lastly, Bert Gardner brought his bag to Mr. Cassidy. The gasps accompanying the whole counting process now joined into a single exhale and some unprecedented smattering of claps amongst the group. Mr. Cassidy looked down kindly at the bruised boy in front of him, noting the boy’s satisfaction with the amount--if only slightly disappointed at coming up short. “Well done, Bert Gardner. Or, since you were one below Kid Carson, I suppose I should call you ‘Bertie the Kid,’” he pronounced--a play off of the word “birdie,” the golf term for hitting one shot below par. Mr. Cassidy’s impromptu title would stick until Bertie the Kid’s next opportunity for a Back Nine Rush. That chance came almost exactly one year later. This is the first part in a proposed fall novel. If you know of any business that would be interested in sponsoring a chapter (sole or shared sponsorship available), please have them contact writingreeder@gmail.com.